Painter Si Yan Wong joins us to talk about her paintings of the canners (people who pick up cans and bottles to live) in our communities. She came to notice the canners when she started jogging in her neighborhood in 2015. From her observations, these canners are generally seniors, the indigents and the working poor. They weather extreme conditions by working in the sweltering heat in the summers and braving bone-chilling winds during the winters. Who are they? Where do they come from? What does it say about this affluent city when more and more people are rummaging through rat-infested garbage to locate cans and bottles to survive? 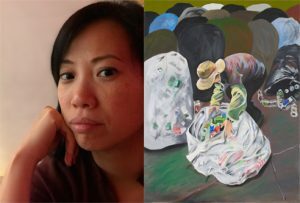 Si Yan Wong is a painter whose socially-engaged art practice invites reflections and conversations into the contradictions and the unseen present in the everyday. Her current and on-going projects include “Five Cents A Can: Making Visible the Invisibles” that focuses on the people (“canners”) who survive on picking up cans and bottles and their existence in a city with many of the “haves.” Find her on Facebook for more information about her upcoming exhibits on the canners as well as on her other socially engaged projects. Tickets are $15 and include wine and Museum admission.